These are just a few words used to describe our attorneys. M. David Johnson opened his own family law practice in 1994. Since then, the practice has grown into one of the state’s premier family law firms, litigating complex divorces throughout Colorado. Our team is committed to providing high-quality services in the most professional manner. We welcome your questions and offer free consultations to help you become as informed about the family law process as possible. Contact our divorce lawyers in Denver, Colorado Springs, Fort Collins, or San Francisco with any questions you might have. Mission: With integrity and compassion, we help people start over. Vision: To help clients resolve conflicts through innovation and technology. Values: Integrity, compassion, professionalism, balance, and excellence. Our lawyers can help with any type of family law case. When you hire our firm, you gain the experience and resources of a seasoned and trusted family law team. Every day, our attorneys collaborate on cases, combining our legal experience with issues and courts for better outcomes. What Sets Our Denver Divorce Lawyers Apart? We’re here to make a difference. At Modern Family Law, we work hard to help people. Each of our lawyers has chosen this field because they know they can make a difference. We are proud to make a difference in a very personal and real way for countless people and their families. We take a team approach. Our entire team has a hand in every case we accept, for the benefit of our clients. We generally assign two lawyers to each case, as well as a paralegal. Every week our attorneys meet to discuss cases and issues over lunch. These meetings are generally not billed to the client. We use advanced technology. Other firms don’t invest in technology because they bill hourly and technology saves time. At our firm, we want our clients to know that we have earned our fee and were sensitive to their budgets. This is why we invest heavily in technology to make us more productive. We protect our clients. We separate a lawyer’s compensation from the fees they collect. Collecting a fee is left to administrative staff members, and only in extreme situations does the attorney become involved. This allows lawyers to be lawyers and to focus on one thing only: doing what’s best for the client. 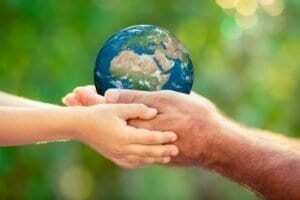 At Modern Family Law, we believe in making the world a better place. We have an obligation to improve the lives of the families we work with, and to impact our planet as little as possible in the process. It’s not cheap or easy to do what’s right for the environment, and it requires a commitment to a long-range plan. With our carefully thought-out green processes and procedures, we reduce our carbon footprint and continue to grow and create new, advanced solutions for our clients and our law firm. On average, each employee of a United States-based law firm uses around 230 reams of paper a year. With 20 employees at our firm, this would put us at 4,600 reams a year – that’s 2.3 million sheets of paper a year! Our green philosophy and commitment to our planet goes beyond our office. It also extends to the courtroom, where our attorneys present their cases and exhibit books as electronic files, utilizing iPads. Our team regularly holds workshops for other law offices in the Denver area to help more lawyers practice green alternatives. It hasn’t been an easy transition, and not all the judges were open to the idea of evidence presented by iPad, but as more and more clients demand efficiency and lawyers capitalize on the advantages of electronic files and evidence, the practice of paperless hearings is becoming a reality throughout the state of Colorado. Contact us today, and let us make a positive difference in your life. At Modern Family Law, our clients come first. If you are ready to learn more, call us today for a free case evaluation at (720) 699-9255.